Sharewood volunteer Will Long, M20, oversees an eye exam in June 2017. Photo: Alonso Nichols. Steven Boucher, D18 (second from right), talks with Cheng Hu before taking a look at his daughter Ya Xuan Hu's teeth in the dental facility at the Sharewood Project on June 20, 2017. Nick Truong, D19, takes notes at right. Photo: Alonso Nichols. 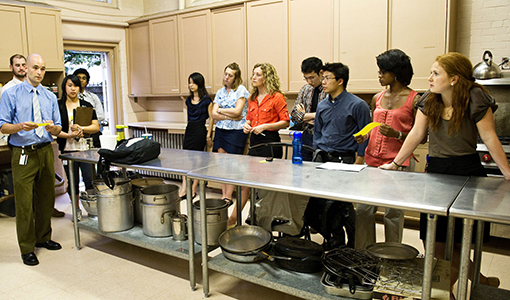 Tufts medical students set up panels for the Sharewood Project in August 2011. Photo: Alonso Nichols. 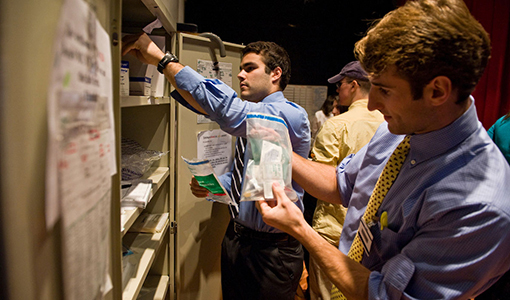 Students organize supplies at the Sharewood Project in November 2008. Photo: Alonso Nichols. Tufts University School of Medicine students at the Sharewood Project at the First Church of Malden on Tuesday, November 18, 2008. Photo: Alonso Nichols. 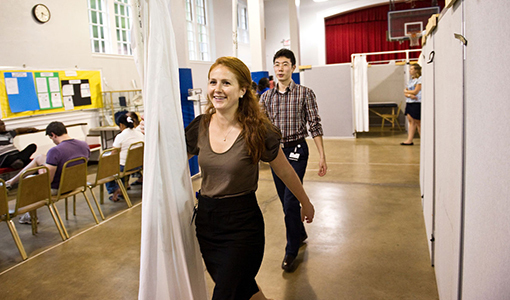 Back in 1996, a group of first- and second-year tufts medical students came up with a bold idea: to open a pop-up center offering free medical care to the underserved residents of Boston’s Chinatown and Bay Village. And, at a time when there were only a few such initiatives in the country, they would run it themselves, from conducting intake interviews to offering treatment advice. 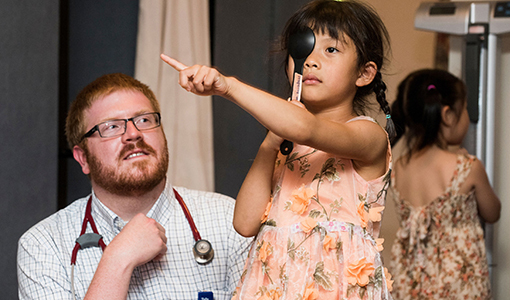 Though faculty and administrators were skeptical at first, the students not only pulled it off but also passed their enthusiasm on to the following year’s physicians-in-training. In honor of the Sharewood Project’s 20th anniversary, here’s a look at how it all happened, in the words of those who were there. Colleen Finnegan, M99: We all went to Tufts because we wanted to make contributions to the world. So the idea behind Sharewood was, What can we do to give back and also further our own understanding of practical medicine at an earlier stage in our training? Jennifer Skolnick, M99, Tufts university school of medicine (TUSM) clinical assistant professor: I spoke with Apple [Sussmann] and Pouné [Saberi] about this ethereal idea of providing health care for the community around the medical center in Boston. I’m remembering that someone suggested the idea and then disappeared. Robert Campbell, M99: There were a couple of people in the class before us who’d tossed around the idea. There was a guy named Chris Engelman. Libby Bradshaw, TUSM assistant professor of public health and community medicine: Chris was a medical student interested in doing community-service learning. Somehow I knew there was a conference going on, and we sent Chris. Chris Engelman, M98: It was at Northeastern. There was a poster there about a student-run medical clinic at another school. Bradshaw: He came back all excited about the idea of starting a free clinic. I thought, This is a horrible idea—it’s so much work and so hard to get off the ground. But I felt like I was committed to him. Engelman: At that point it was like, How can we get something like that going here? Pouné Saberi, M99, MG99: I have a distinct memory of us having an early meeting: Apple, Colleen, Jennifer Skolnick, Michael Greger and someone I didn’t know as well—that must have been Chris Engelman. With the help of them and the others, it kind of all came together. Tufts medical students set up the panels for the Sharewood Clinic, sponsored by the Tufts University School of Medicine on Tuesday, August 9, 2011. Photo: Alonso Nichols. With the idea in place, the new project needed a name. Saberi: I said we should call it Sherwood for Sherwood Forest. Rahul Parikh, M99: Taking resources from others and giving them to those in need. We had a debate. Saberi: Everybody was like, That’s offensive. Bradshaw: I thought that might both be too pointed and too obscure, and suggested Sharewood as one of several options. Saberi: Sharewood—like, we share. Where the name came from would be our secret. Twenty years later, none of the students have any idea why we called it that. The next step was convincing the Tufts School of Medicine—and the Massachusetts Department of Public Health—that students could actually pull it all off. Ezra Barzilay, A95, M01: We were largely dismissed by the folks in the more established routes of health care access. They were like, This is futile. You guys are students. Finnegan: We presented our idea to the university leadership. A few people found it interesting but said we weren’t going to get anywhere unless we found a legitimate medical doctor who would back us up. Skolnick: We contacted Mark Pearlmutter and talked to him on the lawn at St. Elizabeth’s Hospital during his workday. Mark Pearlmutter, M84, TUSM associate professor: For a good hour or two, I listened to their ideas. I remember saying to myself, This is crazy. But at the same time, they had so much passion I couldn’t resist hearing them out. In any case, I couldn’t dedicate the time needed to help build this with them, so that’s when I brought in Brian. Brian Lisse, TUSM clinical associate professor and founding Sharewood medical director/ADVISER (1997–’01): I had a job teaching at St. E’s, where Mark Pearlmutter was my boss. I didn’t know much about Tufts, but it seemed like a good idea for a medical school to have a free clinic. Pearlmutter: The true hero behind that clinic and making it work was . . . me. No, I’m kidding! It was Brian Lisse. He threw himself into it as their mentor. Lisse: John Harrington was the dean of the medical school at that time. He heard what we wanted to do and said, “As far as I’m concerned, this is a student club. If it works out, we’re going to love it, and if it falls on its face, I’ve never heard of you.” He figured out a way to disavow it if needed but at the same time be supportive. Bradshaw: We met over the summer with Pouné, Colleen and Apple. We heard the students out, but we also brainstormed with them about the issues that would be involved. Lisse: One student had to figure out the legal part of it. He went to the Massachusetts Department of Public Health and came back shaking his head. He said, “I had the weirdest experience. I talked to the person and she kept saying, ‘No, you don’t want to open a clinic.’ ” Turns out the word clinic has requirements for a whole bunch of federal and state mandates that we did not want to get involved in. The students came up with Sharewood Project instead. Tufts medical students meet before opening the Sharewood Clinic, sponsored by the Tufts University School of Medicine on Tuesday, August 9, 2011. Photo: Alonso Nichols. The newly minted Sharewood Project got the greenlight, but the students still needed to find a space where they could see patients. Saberi: There was a theater production—Nunsense or something—in a little building right next to New England Medical Center that housed the Church of All Nations. We wondered if that space could be available. Skolnick: We went to see the pastor to ask if she would be interested in serving the community with a medical clinic. Bryant gave Sharewood the roughly 2,000-square-foot space to use, gratis, for four hours every Tuesday night. The church had some unused office dividers the students rolled out of storage every week to create temporary treatment rooms. To outfit the new center, they collected medical equipment and supplies from anyone willing to contribute. Saberi: In my naiveté I was like, What could be easier than this? “If you build it, they will come.” But then, of course, there was a tremendous amount of detail that had to be worked out. Barzilay: Because we were so close to Chinatown, we were approaching a community of immigrants who were not particularly trustful of outsiders. We went door to door to some of the larger businesses and gave them brochures in different languages saying we’d have interpreters and that people didn’t need insurance. Skolnick: We met with pharmacy representatives and got samples for our free pharmacy. We used the same procedure to get used equipment from clinics that no longer needed it. I don’t remember where we got exam tables, but we had six or eight of them. Kevin Donaghy, M99: The church board was worried Sharewood would become a target for people looking to steal drugs. We ended up having to hire an off-duty police officer because of security concerns. That was a huge expense. Sausan Campbell, M99: We decided to have an evening auction to raise money. Jennifer Skolnick and I went to every store on Newbury Street and Commonwealth Avenue to ask if they’d be willing to support us. Skolnick: I remember walking the streets of Boston carrying home an enormous stuffed duck from FAO Schwartz that was much bigger than me. I got many strange looks. Even with just two bottles of bourbon, the auction was a big success, raising the money the Sharewood Project needed to open its doors. On the evening of February 18, 1997, the first patients arrived. Lisse: The first person a patient saw was someone in triage, who figured out whether they should be seen right away. Then usually two students would go in to see the patient. They’d take a history and do a physical, then come upstairs and tell the attendings about it. Then we’d all go back down together and see the patient again. It may sound cumbersome, but it’s the model you use when teaching third- and fourth-year students. Barzilay: My first patient was a very diminutive, elderly Asian woman. suction cups to position on the chest. I was like, What am I doing with all these? But the attending walked me through the process. Sausan Campbell: I had a woman come in with coughing, abdominal pain, maybe some vaginal bleeding. So I was going to do a full workup on her. I had a feeling like, Am I doing this right? I did a cardiac exam to make sure I didn’t miss a heart murmur. And there was fluid in her lungs—I had never diagnosed someone with pneumonia before. It was definitely exciting and unnerving, but mostly I remember thinking, Wow, this person is trusting us, the attending and I, to come up with an answer for her. I felt very humbled by her trust. Finnegan: After all those years of preparing for medical school, it was so thrilling just to put your hands on somebody, even if they just had a sinus infection. Lisse: Almost the entire first-year medical-school class signed up to work there. Donaghy: This was a way to get hands-on experience and serve a community need. We liked that aspect. We were also eager to not overstep. We weren’t trying to replace what a hospital can provide. Skolnick: We were visited by psychiatrists and gynecologists on staff at Tufts who were interested in adding services. New England Eye Center saw a few patients for free. Barzilay: It was like watching fire spread. First, word spread within the rest of the classes within Tufts, then to Boston University and Harvard, where people started asking if they could come help with it. Then we started getting a much steadier stream of attendings who were willing to put in their evenings pro bono. All within one year. As the founders moved into their third-year rotations, they could volunteer only at Sharewood sporadically, if at all, and turned over management to the incoming class—a model the project follows today. Things went relatively smoothly until 2001, when Pastor Karen Bryant learned her church was bringing in a new leader. Lisse: Karen was very upset. They replaced her with someone who had an MBA and confronted us with something like $35,000 a year in rent to stay there for four hours each Tuesday. We just said, Are you kidding? Bryant: They closed down the programs in the building one by one. I was shipped out to a church in Braintree. Lisse: We tried to find middle ground but Karen’s replacement said no. So the students started canvassing the area to find a new home. Joseph Gravel Jr., A82, M86, former Sharewood medical director and ADVISER (2001-09): I knew some of the churches in Malden, so I started knocking on doors. I got a preliminary yes from the Centre United Methodist Church. We had to go before their board of trustees, and they approved it. Mary y. Lee, j75, m83, former associate provost and TUSM dean for educational affairs: Malden is one of the main sites for the Tufts family medicine residency. That turned out to be critical when they adopted Sharewood. Gravel: The move was like the Battle of Dunkirk. The students were so organized and dedicated to keeping Sharewood open. They brought everything over in their cars to Malden in a weekend. Every class coming through Sharewood would tackle its own challenges. 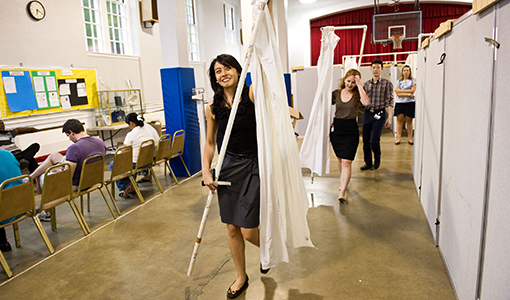 In 2005, students had to move the project again, to a second church in Malden. Around that time, a new problem cropped up: The number of patients was waning. Daniel Slate, A11: When I started volunteering as an undergrad, there were more students who wanted to get involved than could every week because of low demand. They were seeing maybe five to six patients a night. Rebecca Scott, TUSM senior director of development and alumni relations: When I got involved as a volunteer adviser, the med students said volunteering at Sharewood was a great opportunity to get some studying done. relationships with them and make them aware of our services. Scott: Then the recession came, and that was a game-changer. Even people who had health insurance started coming to Sharewood because they could no longer afford their co-pays. Slate: Demand more than tripled. We were seeing 20 to 30 patients a night. Scott: No one has called Sharewood a great opportunity to study since that time. The number of undergraduates volunteering in the clinic also increased. 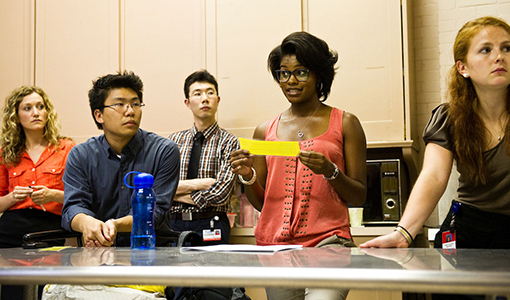 Over time, students from the Friedman School of Nutrition Science and Policy and from the Tufts University School of Dental Medicine also got involved. Scott: Dan [Slate] was the guy who changed Sharewood on the undergrad campus from being a subgroup of the Pre-Med Society to being its own recognized, separate club—and one of the largest at the university. Slate: We needed more funding to handle the increased case load, and to get the funding we needed to measure our impact on the community. I brought in a computer science team from Tufts to work on building a first version of the electronic health-record system. Gregory Sawin, Tufts Family Medicine Residency director and Sharewood medical director and Advisor: One of the big pushes I tried to make during my tenure was getting people signed up for insurance in hopes of transitioning them into long-term primary-care relationships. Nitin Jethmalani, A16, M20: Sharewood now helps one in six clients apply for MassHealth and consults with numerous others on food-stamp and WIC applications. Many clients are children who have recently moved to America and need a physical. Sharewood allows them to start school earlier than if they had to wait for an appointment at a traditional clinic, assuming they could afford one. Virginia (Paige) Murphy, N17: There are 16 dietetic interns who are both graduate students at the Friedman School and rotating through the hospital. All 16 participate in the Sharewood Project to provide nutrition assessment and counseling to patients who require it. 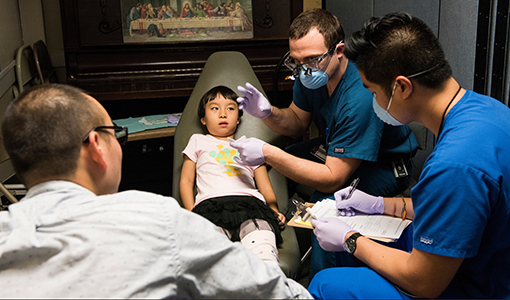 David Leader, D85, MG13, Dental School associate professor and director of the DMD/MPH dual-degree track: Two Tuesdays a month since 2010, a few dental students have been going to Sharewood to do fluoride treatments, head-and-neck cancer screenings and referrals. They get no course credit for it and have to miss clinic time, but it’s a great opportunity for interprofessional education in real time. 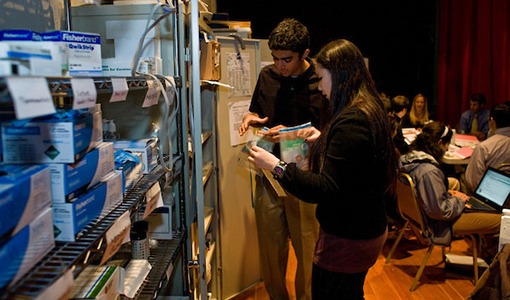 It helps students see how medicine and dentistry fit together. Murphy: The Sharewood Project is unique because it allows graduate students from a number of disciplines across the Tufts community to combine forces and give back. The Sharewood Project, now based at St. Paul’s Parish Church in Malden, sees about 950 people every year. The experience has had a lasting impact on those involved. Eric Swanson, A12, MG16, M20: It’s an excellent learning opportunity for first-years to have that direct interaction with people seeking care. Michael Greger, M99: It makes them remember and keep that idealism they arrived with. Barzilay: There were five more years between our second year volunteering at Sharewood and getting through medical school. But it gave us a preview: We knew what it was like to actually care for someone. Elena Hill, A13, M17, MG17: I triaged a patient early on who was having a really tough time. A little while later I got a 10-page handwritten letter in the mail thanking me for taking the time to talk with her and make her feel normal again. Robert Campbell: Patients want that one-on-one connection. Things like Sharewood have a sort of magic; they establish a connection that’s really at the base of what we do. Pearlmutter: It makes students realize overnight that being a physician is often not always about making life-and-death decisions. It’s about supporting the community and doing the little things that make a difference in someone’s life. Elizabeth Gehrman is a writer based in Buffalo, N.Y.